Meet Terry Waller, the crafter of the Water for All method, also known as the “Baptist” drilling method. He developed it over many years as a Baptist missionary in Equatorial Guinea and Bolivia, because water was such a critical need for the people he knew. Here’s Terry at the church plant compound next to his house in San Julian, Bolivia. 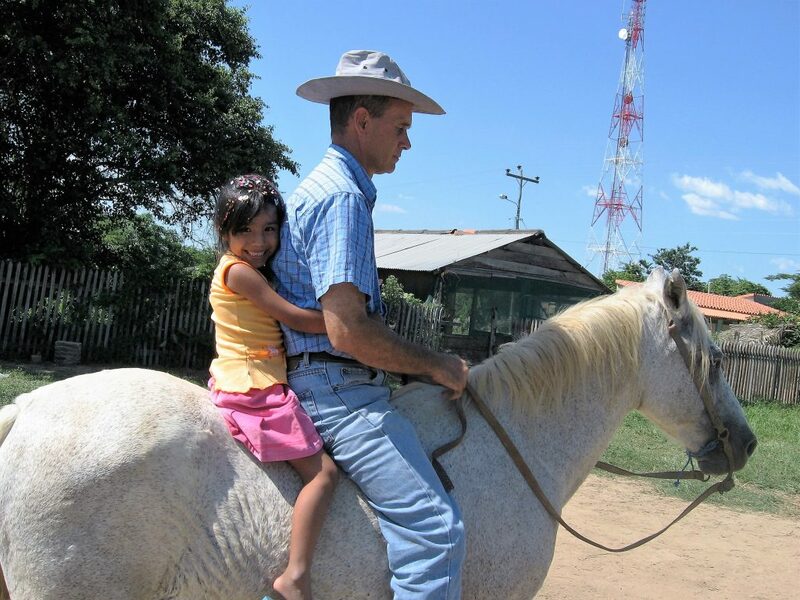 He is taking his daughter, Marilu for a ride on her birthday present. He was unable to resist the cuteness of her request. After long years of perfecting, today the WFA method is a highly reproducible, effective and affordable way to make and maintain family-size water wells. It’s a general method which is now taught to missionaries (mostly) who in turn teach rural folks in developing countries around the world to utilize, usually with the missionaries’ leadership (with minor adaptations according to countries’ differing cultures, available materials, soil types, etc). The idea is that the local labor force is mobilized to make and maintain their own water sources. The very long-term goal is that the making and use of our technology will so deeply and widely become common know-how in a given country that the rural communities will be able to handle their water needs by themselves. The achievement of quality, long-term local reproduction, however, requires such momentum as can only be achieved by a missionary’s commitment to live and work with the people of that country long term. The shorter term goals are simply to train locals and work with the local communities to make lots and lots of good, family-owned, easily maintainable water wells. And to enjoy and cultivate the fertile relationships found in the process. The work itself is done manually, which makes it more manageable and reproducible within our cultural context than using large machines. All necessary materials are affordable even for the farmers who would use them. This includes the making of drilling tools, the drilling, the pump making, pump installation and pump maintenance. This fact means hope for the growing population in this economic context. It also enables us to make tons of wells with a relatively minuscule budget. All materials are portable and thus can be (and often are) used where trucks and large drilling rigs can’t go, and thus fits the geographic context as well. The process involves personal investment of time and funds by those who would receive wells and the process ends with their personal ownership of a well at their house. We think this is wonderful, because 1) their new household asset will be earned in dignity; not received as a handout, 2) the personal investment ensures that initiative will be taken to maintain the well, and 3) a water well in their own compound means that they (and their kids) won’t have to lug jerry cans, which saves their time and their backs. The pumps are designed for simple, affordable maintenance so that well owners can easily replace worn parts and keep their wells working indefinitely, and the well owners are trained to do so. The labor of drilling is provided by the people who get the water wells at their houses, through groups coined “well clubs” (again by Terry). The method thus empowers the community through a practical learning experience to move closer to more appropriate dominion over their environment. A well club is a group of ten heads of household. Their names will be written down on a list. When a club begins, they will work together on a full time (or more) basis until the club is finished. 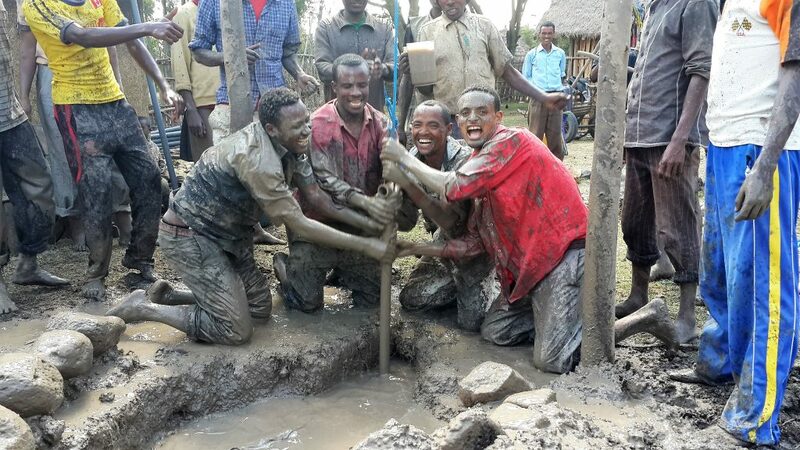 A club is finished when ten water wells are completed, one at each member’s house. Every member will purchase for themselves certain designated materials for their own household water well as a personal investment. Every member will provide one laborer daily (either themselves, a family member, a neighbor or a hired laborer) usually six days a week until the club is finished. a. A member (or his laborer) who is late to the work site in the morning without club consent will pay a predetermined fine to each of the other club members. b. A member (or his laborer) who is absent on a work day without club consent will pay a double fine to each of the other club members. With these rules, the clubs are motivated and are able to self-govern so that we can simply lead the technical side of things. Pictured above is a well club in the process of drilling! Looks like fun, doesn’t it? It is, once you give up trying to stay clean, that is! It is challenging! It’s a cooperative adventure through which friendships are made, skills are learned, characters are tested, and dignity is gained because it involves hard work and personal investment, and results in a truly life-changing accomplishment. The sense of common achievement at the end of a club is palpable. 4. 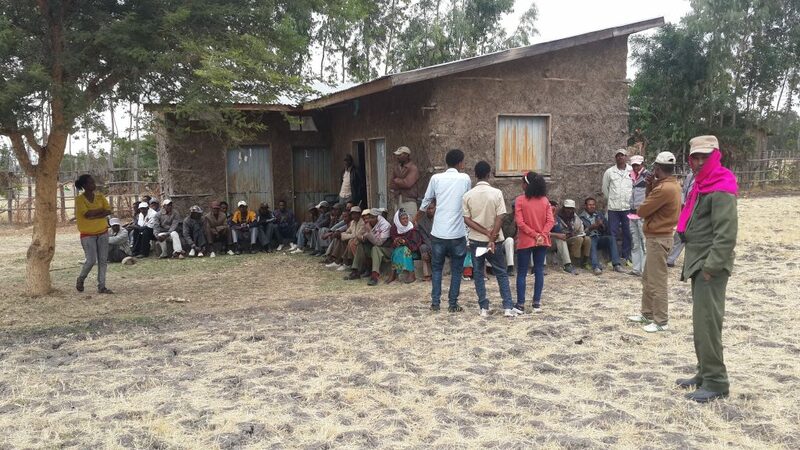 Skilled national servant leaders such as these inspire hope among rural communities where life often feels bleak. The above pictures snapshot a several month field training for potential leaders. 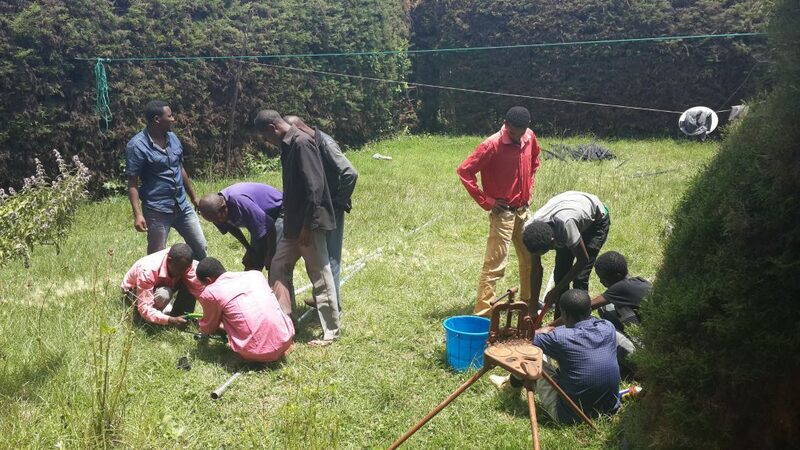 The full initial training included basic shop work, tool and pump making, well drilling, well conditioning, pump installation, and pump maintenance. 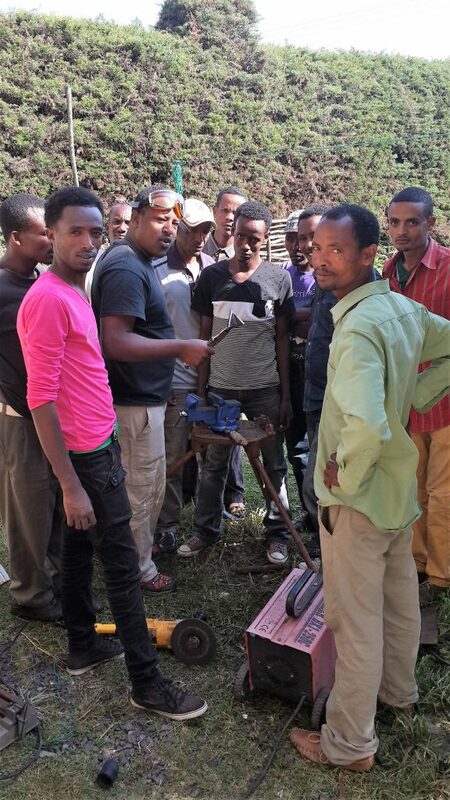 We now employ four trained men and one trained woman as well drillers. The training for them continues indefinitely.